With healthcare costs on the rise and large companies like Google offering monstrous employee perks like free meals, childcare, oil changes, yoga, and massages, it can be hard for your small or mid-size business to keep up to recruit employees. Additionally, keeping employees satisfied is posing more difficulties. You’re doing the best you can to offer healthcare benefits and track ACA compliance— but how does your company compete with the benefits and perks large companies offer? The truth is, while these perks sound great, most people look for simpler benefits that add real value to their lives—a job that makes them feel respected, allows them to spend more time with family, and gives a strong sense of job security. Maybe you don’t see the value in employee benefits and perks. Sure, you’re offering healthcare opportunities for eligible employees to enroll in according to the ACA and Shared Responsibility Reporting, but you can’t afford the time or money it costs for other workplace benefits and perks be they retirement plans or paid gym memberships. In a recent study on the importance of workplace benefits, Guardian Life found that two-thirds of workers rated workplace benefits as a very important factor when choosing whether or not to stay with their current employers. Nearly 3 in 4 workers say that benefits play an important role when deciding whether or not to leave their current place of work and look for a new job. Employee benefits do matter. The good news is we’ve got some alternative employee benefits and perks to offer in order to better recruit and retain skilled, happy employees. Which benefits matter most to employees? Of course, there are the big ones: health insurance and paid leave, along with life insurance and retirement plans (depending on the generation). But what are the other benefits attracting and keeping employees? Telecommuting: if possible, give employees the option to work from home. Even if this happens only a few times a quarter, a little flexibility can go a long way for employee engagement and satisfaction. This also shows a certain level of trust the employer has for the employee, also contributing to employee engagement. Professional development: encourage employees to attend webinars, seminars, and conferences to learn more about their field or the tools they use. Flexible schedule / compressed work week: give employees the option to work longer hours on certain days for a shorter work week (but be sure you’re still complying with FLSA laws). Sick/Vacation time without the guilt: often employees won’t take needed sick days or vacation days because they feel guilty about missing work. Encourage an environment with an understanding of when to take time off. Discount at the gym: Maybe you can’t afford to pay for every employee’s gym membership, but many gyms will offer corporate discounts or employee wellness programs. Company-sponsored rec sports: Sponsor a recreational sports league for employees to join. This not only promotes teamwork and physical activity, it show your employees you care. Volunteer programs/paid leave for volunteer work: This is trending with a number of companies these days. People want to give back, but often struggle to find the time. Designate an employee to organize a service committee or let employees dedicate so many hours per month or quarter to volunteer work. Employee discounts: If your company sells a product or service that could be useful to the employees, offer them discounts. Worthwhile discounts. If your discounts aren’t significant, it will likely be seen as lack of appreciation and could do more harm than no discount at all. Early access or friends and family deals are other options. Get creative! Some crowdfunding startups give employees “bucks” or points to donate to the campaign of their choice on a monthly or quarterly basis. Tuition assistance: help employees with continuing education.Your employees are some of the biggest assets to your company, so the more they learn, the better they are for your company. Plus, if you’re offering other great benefits, why would they ever want to leave? Pet-friendly workplace: Let man bring his best friend into the office and you could see the stress levels in the office decrease. Educate your employees about their benefits and get behind them too. All these alternative employee benefits and perks will be useless if your workers aren’t educated about them or don’t feel the employer has done the research to find the most valuable benefits. Be sure your employees get properly informed about their benefits, and know the company endorses these benefits. People who understand and appreciate the value of their employee benefits are more likely to enroll in or take advantage of them. The Guardian study also showed that workers who take advantage of their employee benefits are more likely to stay loyal to their employer. 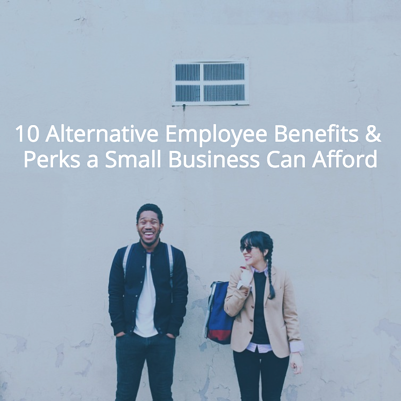 There are ways for small and mid-size businesses to offer alternative employee benefits and perks without going bankrupt. Like employee engagement, a little can go a long way. You may be surprised by how little changes can make a big difference in the workplace! Looking for more tips to improve your workplace? Become an HR pro when you subscribe to the Fuse blog!